In The Thief of Baghdad (also known as 12 Thieves) you control a band of thieves who are planning on robbing the nearby palaces. Your band of thieves must work together in order to infiltrate the palace and take the treasure before one of the other gangs of thieves steal it from under your nose. 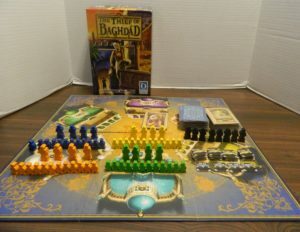 The Thief of Baghdad is a light to moderate strategy game involving set collection, area control and some abstract mechanics. 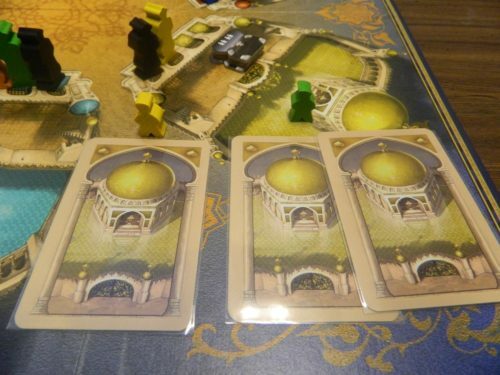 While it feels a little simple at first, as you begin to see the underlying strategy The Thief of Baghdad overcomes it reliance on luck to be a pretty good game. Create six stacks of treasure chests. Each stack of treasure chests will have four treasure chests in it. The top treasure chest will show four people. The next treasure chest will have five people, then six people and finally seven people. One black neutral guard is placed in front of each palace. The dancer cards are put in a pile next to the board. The palace cards are shuffled and placed in a face down pile on the table. Depending on the number of players each player is dealt a number of palace cards. For a two player game the first player gets six cards and the other player gets seven cards. For a three player game the first player gets six cards, the second gets seven cards, and the third gets eight cards. For a four player game the first player gets 6 cards, the second seven cards, the third eight cards, and the fourth nine cards. Each player takes all of the thieves of their color. Players will take a number of guards of their color based on the number of players: 2 players-4 guards, 3 players-3 guards, 4 players-2 guards. Players take turns placing one of their guards on one of the palaces on the board. The oldest player starts the game. Move one of your guards. In order to place a thief you need to play a palace card(s) matching the palace that you want to move a thief to. For each thief you move into a palace you need to play one of that palace card for each neutral guard or guard controlled by another player that is in front of the palace. This palace currently has two guards in front of it (a neutral and a yellow guard). 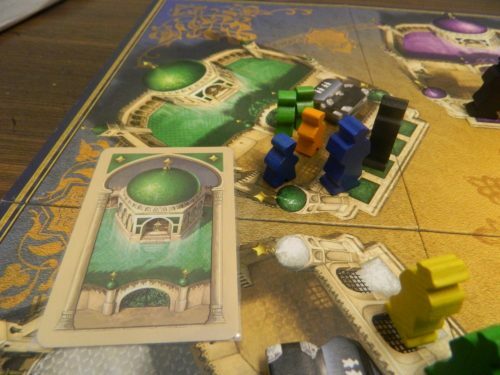 To place a thief in this palace the yellow player will have to play one yellow card. Any of the other players will have to play two yellow cards. If you would like to move one of your guards to another palace you must play one card. The card you play must either match the palace that the guard is currently in or the palace that you want to move the guard to. If the orange player wanted to move their guard from the blue palace to the white palace they could either play a blue or white palace card. If there are no free spaces in front of the palace, the guard cannot be moved to that palace. This palace is filled with guards so no more guards can be added to it. If you want to move one of your guards and a thief (from the same palace) to another palace you must play a card that either matches the palace that they are currently in or the palace that they are moving to. This action cannot be performed if there are no open spaces in front of the palace you want to move them to. 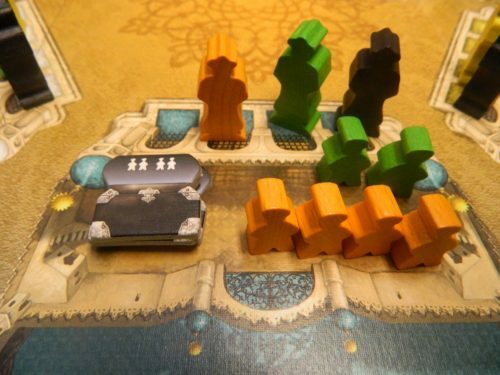 By playing a green card the blue player is able to move their guard along with one of their thieves to another palace. In order to move a neutral guard (black guard) to another palace the player will have to play two cards. The first card must be of the palace that the guard is currently in front of. The other card is for the palace that the guard will be moving to. A guard can only be moved to a palace that has an open space in front of it. By playing these two cards a player can move the neutral guard from the purple palace to the orange palace or move the neutral guard from the orange palace to the purple palace. When a player has as many thieves in a palace as are shown on the top treasure chest, the player will steal that treasure. The player takes the treasure chest and removes all of the thieves responsible for stealing the treasure chest from the board. The top treasure in this palace has four people on it. Since the orange player has four thieves in this palace they will take the treasure. After a player is finished taking actions they will draw cards and end their turn. If the player took at least one action on their turn they will draw three palace cards. If the palace card deck runs out of cards, the discarded cards are shuffled and are used to form a new draw pile. If a player performed no actions on their turn they will get to take four cards. 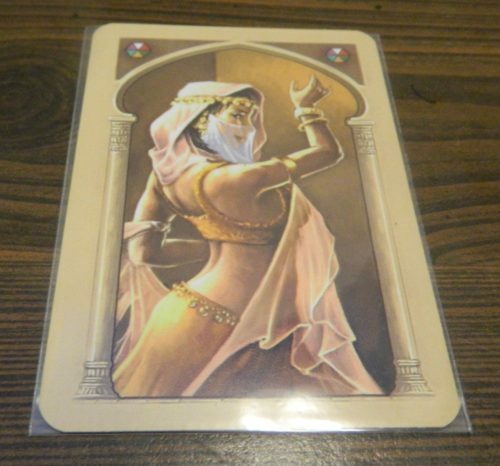 For one of their four cards the player can choose to take a dancer card which acts as a wild card. After a player has drawn cards, play passes to the next player. If a player gets a dancer card they can use it as a wild for any other card in the game. The game ends when one of the players have acquired enough treasure chests. The number of treasure chests needed to win the game is dependent on the number of players. The first player to acquire the needed number of treasure chests wins the game. In a four player game the first player to acquire four treasures wins the game. When I was trying to categorize The Thief of Baghdad I ran into some difficulties. The game has a lot of different mechanics but it really doesn’t have a defining mechanic. The game has some set collection, abstract and even some area control mechanics. If I had to put The Thief of Baghdad into a genre I would probably have to classify it as a resource management game. At first The Thief of Baghdad doesn’t really feel like a resource management game. As soon as you start playing the game though you quickly realize the key to winning The Thief of Baghdad is to wisely use your cards. Since every player is only dealt a given number of cards you need to use them wisely if you want to win the game. To be successful in the game you need to find the opportunities where you can add and move thieves using the least number of cards. If a palace requires you to pay three or four cards to add one thief to a palace that is not a good use of your cards. You are better off either going after a cheaper palace or putting thieves on other palaces and using guards to move them into the expensive palace. Cards are king in the game and having access to more of them gives you an advantage. While no one tried, I wonder how it would work if a player purposely sacrificed a couple rounds just to draw a bunch of cards. This would give them multiple wild cards which are quite valuable in the game. With a lot of cards a player could really take advantage of the cheap palaces. The one reason why I don’t know if this strategy would work though would be that there is a limit on how many moves you can make in a turn that involve a thief. While you could get a lot of cards that could let you perform a bunch of actions, you would only be able to perform so many actions with thieves each turn. Being a light to moderate strategy game I wouldn’t consider The Thief of Baghdad to be very difficult. Since you are basically just collecting cards and using them to perform one of four different actions, you can learn the whole game in around five minutes. It takes a while longer to fully grasp the strategy of the game though. At around the midpoint of your first game you will start to understand how the different actions work together to give you different strategic options. 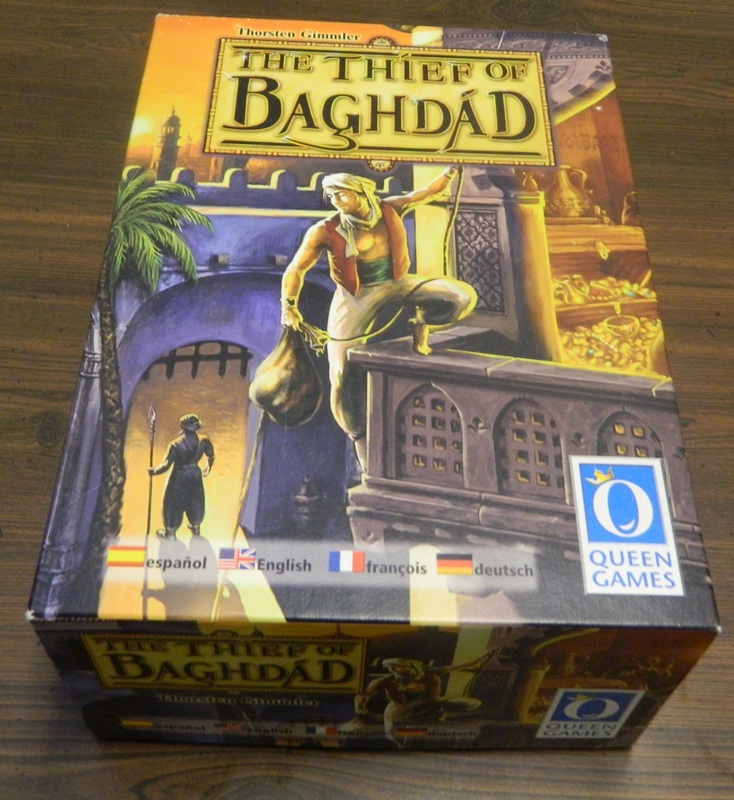 While I probably wouldn’t play the game with really young children or people who have never played a board game other than Monopoly, I think The Thief of Baghdad could work pretty well as a gateway game for people who really haven’t played many strategic games. At first The Thief of Baghdad might not seem that strategic. When you first start playing the game you will probably think that the key to the game is acquire a bunch of cards of the same color so you can start putting a bunch of thieves into the same palace. When possible this is the best strategy in the game since it will save you cards. This likely won’t be an option for the whole game though so you will have to develop new strategies. At first the guards might not seem that important but once you figure out how to properly use them, they become one of the most important parts of the game. The first reason why the guards are important is that they regulate the cost that you need to pay to bring thieves into a palace. This actually comes into play in quite a few different ways. If you know that another player is trying to steal the treasure from one of the palaces you might want to move your guard or one of the neutral guards to that palace forcing that player to pay more cards if they want to add more thieves to the palace. You could also use your guards as blockers to fill in the last space for a palace to prevent other players from adding guards to the palace increasing its’ price. The area where the guards are even more important is helping move thieves from one palace to another. At first I didn’t think this ability would be very valuable but the more you play the game the more you see the value in it. While it is nice being able to just play one card to add a thief to your target palace, you aren’t always going to have the necessary cards to add a thief to the palace that you want. The palace you want to add thieves to could also be really expensive requiring several cards for every thief you want to add. You can use guards for a workaround though since you could put thieves into a cheap palace that you have a couple cards for and then use a guard to move them to your target palace. This ability to use guards to move thieves actually gives you a lot of potential options on any given turn. On my last turn I needed to get two thieves into a palace to get the final treasure that I needed to win. I did not have the right cards to just add them directly since the target palace was filled with guards. I was able to find a way to win the game though by following an unorthodox process. First I had to move one of the neutral guards out of the desired palace to make room for my own guards. Next I moved one of my guards along with a thief into the target palace which got me one of the two thieves I needed. I then had to move the same guard into another palace where I had a thief waiting. I picked up the thief and brought it back to the target palace and won the game. I had to go through all of these steps just to move two thieves into one palace. The previous example illustrates the thing I like most about The Thief of Baghdad. The game seems really simple at first but there is actually a decent amount of strategy to the game if you are willing to think outside of the box. The most obvious move is to directly place the thieves into the palace you want to rob. This is not always an option though since you either don’t have the necessary cards or it could actually be cheaper to place them in another palace and then move them to the target palace. At first it might not seem like there is a lot to the game but as you continue to play the game, you start to figure out these alternative ways to approach the game and the game really starts to pick up. While The Thief of Baghdad has more strategy than you would initially think, the game does still rely quite a bit on luck. Card draw luck is pretty important in the game. When drawing cards you probably want to draw cards of a couple colors instead of drawing cards of a bunch of different colors. 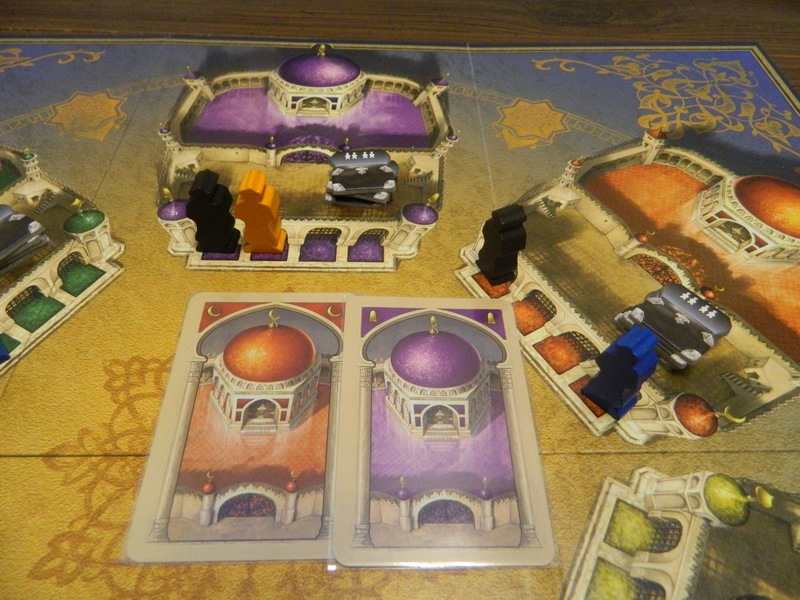 Having several cards of the same color allows a player to target a specific palace and take a treasure. With a wide variety of cards it is much harder to perform more than an action or two on a given turn. Card draw luck also comes into play with drawing the right cards at the right time. None of the palace cards are better or worse than other cards. At different points in the game though some cards can become more valuable than others. If you end up drawing a lot of cards for a palace that has a lot of guards in front of it, those cards are not very valuable at the current time so you are better off holding them for later. If you draw a lot of cards for a palace that has few guards in front of it though, these cards can be quite valuable. The gameboard will regularly change but it is beneficial to draw cards that you can play right away rather than drawing cards that you are better off waiting to play. The game’s component quality is pretty good for the most part. I love the game’s wooden meeples since I always like seeing new types of wooden meeples. The quality of the components as a whole are quite good. The game’s artwork is nice. The game does reuse a lot of its’ artwork though since every card in the game looks exactly the same except for the color of the roof. There is nothing wrong with the artwork but it gets a little repetitive when all of the cards basically look the same. Should You Buy The Thief of Baghdad? For the most part I enjoyed The Thief of Baghdad. The game is easy to learn but there is a surprising amount of depth hidden in the game. While the best strategy is to maximize the use of your cards, you will likely have to find creative ways to use the different actions to get the results you want. In particular you really need to find ways to utilize your guards in order to move thieves around the gameboard. While there is a decent amount of strategy in the game there is still a pretty high reliance on luck which keeps the game from being as good as it could have been. 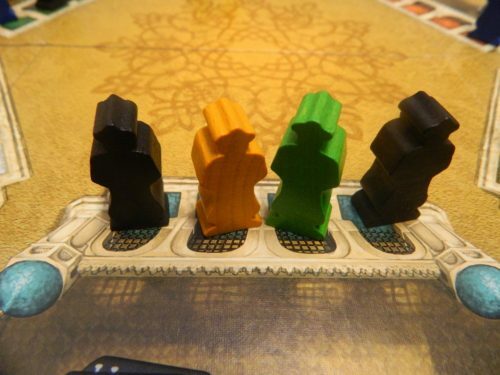 If the game’s mechanics don’t really interest you or you are looking for a more strategic game, The Thief of Baghdad probably won’t be for you. 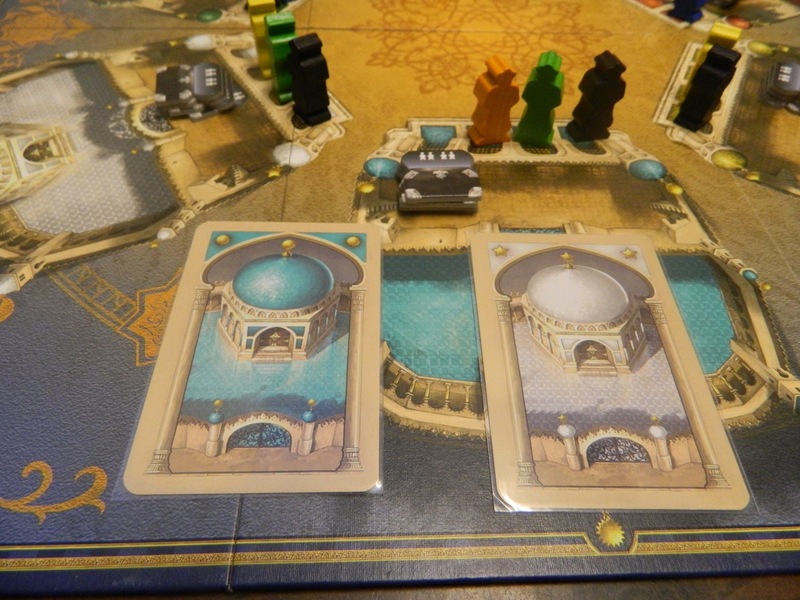 If you are looking for an fun, easy to pick up but hard to master game, I think you will enjoy The Thief of Baghdad. I haven’t played the game in a while but I believe you don’t have to pay any cards if there are no neutral guards or guards belonging to the other players. There is quite a bit of strategy using the guards. Relies too much on drawing the right cards at the right times. Takes a while to fully understand the strategy behind the game.